Riding the Rocky Mountaineer Vancouver to Calgary and back! My day started predawn with checking out of the Day's Inn and taking the Skytrain to the Pacific Central Station. It had rained last night but I had arrived nice and dry. I checked in with the Rocky Mountaineer Staff where I checked my bag with my dirty laundry and received my car/seat assignment. I went and had a McDonalds breakfast before I did a few word fill in puzzles until boarding time. With a toot of a train whistle, I led the way to the train being the first passenger of the 2001 Rocky Mountaineer season out the door to board. I boarded car seven of a twenty-two car consist and dropped my bag on my seat to go photograph our train as the rain started. Nothing was going to damper my enthusiasm on the start of this rail journey. Tina my car attendant handed out letters which when held up in order read "Cheers! To a great 12th season". I got to hold up the "S" along with the exclamation point. 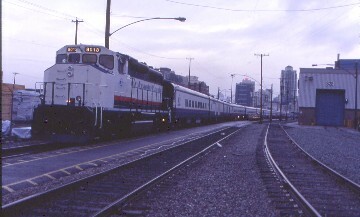 As the train left Vancouver we gave all the employees a big send off with the letters and waving. The entire office staff of Rocky Mountaineer were on the ground to see us off. Did we win the contest that the onboard crews were having? I would hope so. 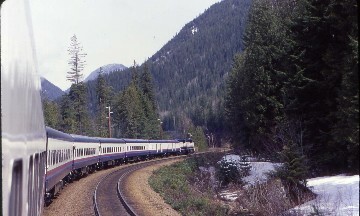 We left Vancouver over the same route that Via's Canadian takes but the big difference and selling point of this train is the all daylight operation so a passenger will get to see all the scenery along the route. Add to that the fantastic cars and the great service that the crew provides, you have one winning service. Breakfast was served leaving Vancouver at your seat but being a very finicky eater I was off to the vestibule for some pictures in the pouring rain. The crossing of the Fraser River at New Westminster was intense and then I sat back enjoying the trains passage through the CN Yards and out along the Fraser River to Page where in a driving rain I shot our passage onto the CP Rail and the crossing of the Fraser River to Mission City. Now this was where the fun for me was going to start, a daylight trip up the Fraser River Canyon in the rain. I did not care what the weather was like, I was going to enjoy this no matter what. We passed Nicomen Island before crossing the drawbridge at Harrison Mills. We popped out of the Twin Tunnels and passed through Agassiz with the rain letting up some. The clouds hung low at this point obscuring the peaks of the mountains. We passed through Ruby Creek and on the other side of the river was the town of Hope. It is here where the canyon starts to narrow as we crossed Schkam Creek and plunged into another tunnel. We bridged American Bar Creek and traveled through Choate. The canyon narrows and deepens as we crossed Emory Creek prior to rolling through Yale. 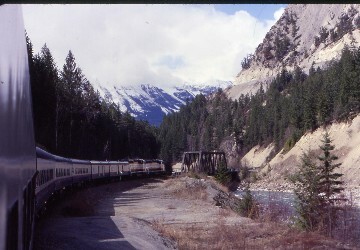 About two miles north of Yale the tracks made a left hand turn to the east and after passing Yale Creek the Rocky Mountaineer went through the four Yale Tunnels. Of course while all this is happening across the Fraser River the CN mainline can be seen. It becomes more spectacular as we continue our journey. Down in the river we passed Saddle Rock before our crossing of Sawmill Creek. The trees came into play blocking the view across the canyon. We bridged Spuzzum and Tikwalus Creeks, past the old Alexander Bridge which was the first suspension bridge in all of Canada right before the train plunged into the Dutchman Bar tunnel. 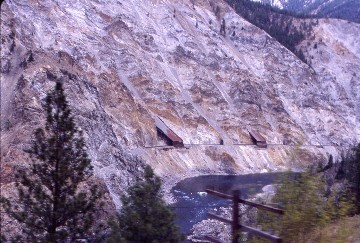 The canyon got more rugged with four additional tunnels before White Creek and then the White Creek Tunnel. 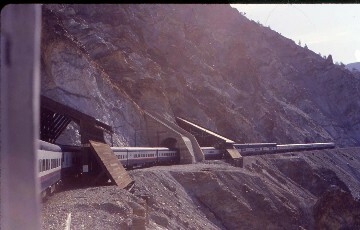 With the passage of the train through two more tunnels the Rocky Mountaineer reached Hell's Gate. 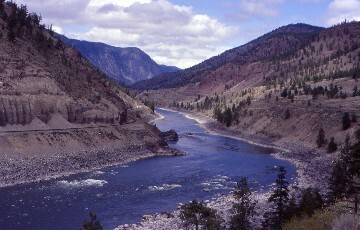 Hells Gate is a rock formation along the Fraser River. Here is the Hell's Gate Airtram that delivers visitors from the Trans Canadian Highway to the bottom of the canyon. There are also fish ladders to allow Salmon a safe way to swim upstream. We passed through Hell's Gate with almost everyone shooting pictures or video. It is one impressive landmark. Continuing north, we passed through the last of the tunnels before China Bar and crossed Scuzzy Creek before we pulled into North Bend for a crew change. Leaving North Bend my next point of interest is the Cisco Bridges. 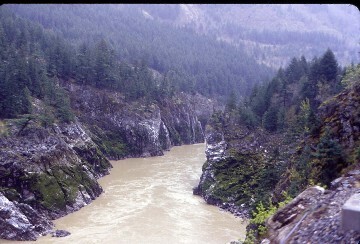 The Fraser River is a muddy brown as it churns and drops its way to the Pacific Ocean. As I was eating lunch, I almost missed Nakatlack Canyon but I had looked up with the camera just in time. 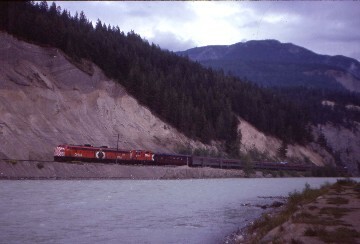 A CP Rail coal train was running across the river on the CN line was just one example of the directional running that the two railroads use with westbound trains running on the Canadian National and the eastbound trains run on the Canadian Pacific between Mission City/Page and Basque. I filled out an order form for my trip souvenirs that will be on my seat when I board tomorrow morning. 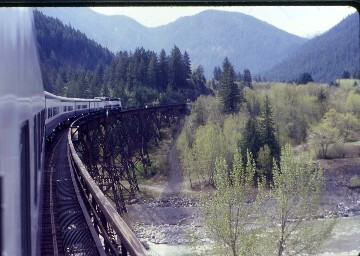 The Rocky Mountaineer traversed Skow Wash and Kavolek Creek before it passed through Kanaka. We entered the Keefer Tunnel and went right out onto the CP Rail Cisco Bridge crossing of the Fraser River. Our train then went under the CN's bridge that crossed the same river. In other words, the railroads switched sides of the canyon. This was necessary because the CP built through the canyon first and took the easier route with the Canadian Northern building through here on the other side of the canyon that the CP did not use. CN did have the advantage of more modern construction methods. Cisco is a truly spectacular place. 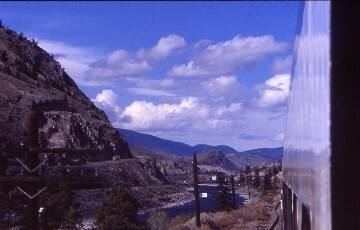 We followed the east side of the Fraser River for about eight more miles to Lytton where the Rocky Mountaineer left the muddy Fraser River and started to follow the deep blue Thompson River to Kamloops. The first area of the Thompson River Canyon we entered is known by either the name of Painted Canyon or Rainbow Canyon for the vivid colors in the rocks that occur here. 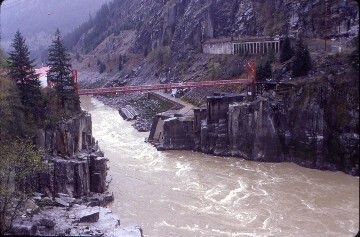 The CP Line is built on the south side of the canyon on a ledge above the river and has the easier route while the CN Line plunges through eight tunnels and rock sheds to achieve their route through the canyon. It is truly spectacular with me smiling knowing that I will be riding on the CN route through here in daylight in three more days westbound. I was loving my autowind on the camera I bought during the Canada trip last December as it has truly come in handy as we made our way through the lower Thompson River Canyon prior to our passing through the town of Thompson. The countryside is becoming more arid as we headed east. Returning to a more northerly trek, we bridged Nicomen Creek and passed by Dryrock. 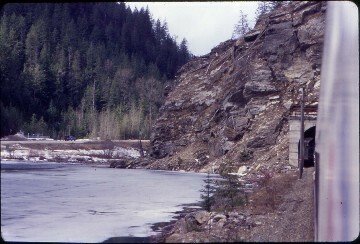 On the other side of the Thompson River the CN deals with the five Skoonka Tunnels and rock sheds. Very impressive. We went next through the community of Spences Bridge before traveling over the Nicola River. 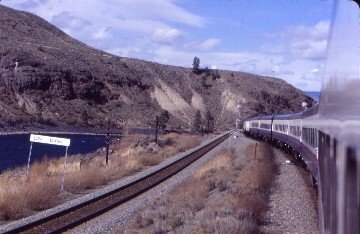 Here the route turned eastward to Kamloops. 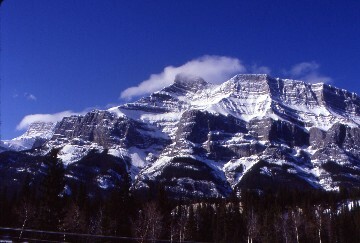 The weather had cleared so Lookout Point and White Mountain became visible. 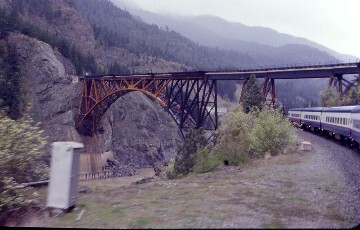 We crossed Pukaist Creek before we came to a halt at Basque to wait for a CN coal train to clear their main line so we could return to the CN for the rest of our trip to Kamloops. 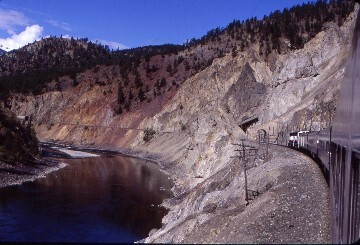 Once on the CN we crossed the Thompson River and passed through two more tunnels in Black Canyon. 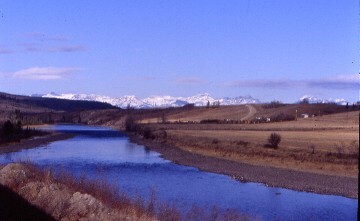 After that it was over Cornwall Creek to the town of Ashcroft. We next flipped flopped over the Thompson River before Savanno before we did another double crossing of the river just short of Kamloops Lake which we followed along the shore most of the rest of the way to Kamloops. Along the shores we passed through a few more tunnels and bridged both Carabine Creek and the Tranquille River before the smokestacks on the outskirts of Kamloops came into view. We crossed the North Thompson River and turned onto a CN branch line (some new mileage) passing an old church that was the model for the one in the movie Unforgiven before we crossed the South Thompson River and pulled to a stop by the old CN Station in Kamloops. 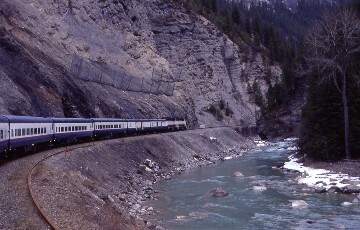 The Rocky Mountaineer owns a fleet of busses that transport their guests to their hotel accommodations for the night. It is all included in the tour package. I stayed at the Aberdeen Inn out in the new part of town out in the hills to the south. I took a walk down to Walmart to get a sweatshirt so I would stay warm riding in the vestibule tomorrow in the mountains. On the train I had bought a ticket to the Two River Junction Dinner Theater, so the bus returned to the hotel and took everyone who paid to go down to the theater near where the train was parked. I was the first person to be seated for their 2001 season. The meal was an all you could eat buffet and I did just that. The show was the story of Billy Miner a train robber and tells his story. I recommend this show to anyone who takes the Rocky Mountaineer. I liked it so much that I bought a CD of it which I will enjoy for years to come. After the show, the bus took us back to the hotel where I got a good night's sleep. Click here for the Day One picture page. The night passed all too quickly with me up and ready for a full day of train riding on a brand new route of new mileage for me. Today is the day that I will get to ride over the route that I always wanted to ride after watching the Canadians passing the campground in Golden at the bottom of Kicking Horse River Canyon on vacations with my parents when I was young. The bus took us all back to the train and after a few quick pictures of the train we departed Kamloops headed for Calgary. Leaving town the Rocky Mountaineer moved slowly down the rest of the CN branchline and then entered the CP mainline and followed the South Thompson River east along the Campbell Bluffs with all of those hoodoos. 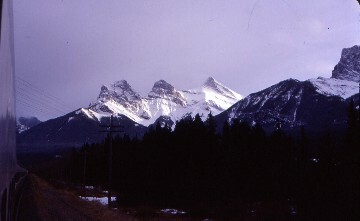 Bill Coos Scenic Rail Guide of Western Canada says that hoodoos are "phallic looking formations of eroded pinnacles of clay and rock topped with an overhanging Capstone." Now that is a definition of them for you. Past Campbell Creek we passed the Billy Miner Train Robbery Site where he robbed the wrong train and got away with a whole fifteen dollars. After the train crossed Monte Creek we passed south of Lion's Head. Rocky Point Bluff is on the southside and further along Whisker Hill is on the northside near Pritchard. We ran through Chase and a little later run above Little Shuswap and Shuswap Lakes. 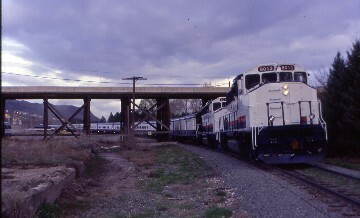 At Notch Hill the line splits with a much longer and easier grade for westbound trains. 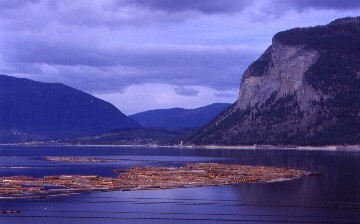 We ran through Carlin and near Tappen reached the shore of the Salmon Arm of Shuswap Lake which we followed for over fifteen miles to the south end of the lake and the town of Salmon Arm. We turned north along the lake for a few miles before we turned east heading through a pair of tunnels that took us to the east end of the lake at Sicamous where we crossed the Sicamous Narrows that leads south to Mara Lake. Sicamous is the house boat capital of Canada. From here we started our climb over the Monashee Mountains along the Eagle River. It was here where I met Natalia who is a car attendant and a very likeable person. We share several things in common and it was nice to have someone to talk to. At Craigellachie we passed the museum that commemorates the driving of the last spike on the Canadian Pacific Railway on November 7, 1885. We journeyed by Kay Falls and the Enchanted Forest Amusement Park. We ran along Griffin and Three Valley Lakes and passed through snowsheds and tunnels. From the summit at Clanwilliam we followed Torkawalta Creek along with another westbound grade separation down to the Columbia River which we crossed prior to a stop at Revelstroke to change crews. Revelstroke also has a Railway Museum to the west of the station. 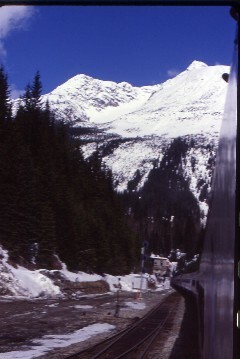 The next highlight for myself was the crossing of Rogers Pass. Leaving Revelstroke we climbed following the Illecillewaet River. We crossed Greeley and Twin Butte Creeks before passing through a tunnel at MP 106.3. We ran up through the beautiful Albert Canyon. 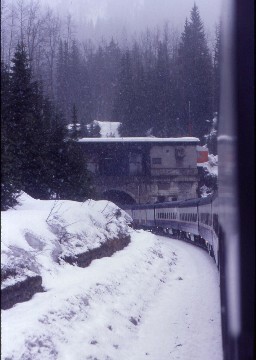 The line became single track at Illecillewaet as the train passed through the Laurie Tunnels and snowsheds. We traveled by Flat Creek and had eight more beautiful snow covered miles to Glacier where it was snowing. We plunged into the 26,517 foot Connaught Tunnel where we spent some time in darkness due to its length. Upon exiting the tunnel we proceeded down grade to Stoney Creek Siding before we slowed for the Stoney Creek Viaduct with a view that I always wanted to see. 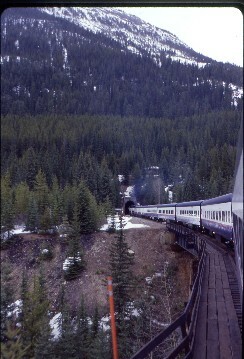 Far below is the westbound line that CP Rail built to use the Mount Macdonald Tunnel which is the longest rail tunnel in North America. We followed the Beavermouth River down grade through Griffith and Rogers to Beavermouth and the junction with the Columbia River again as the river's course took it far to the north and is now descending from the southeast. 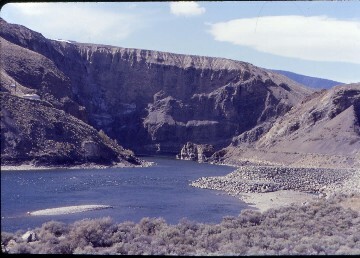 The river has Mica Dam downstream and since the spring runoff has not occurred yet the river level is way down. We passed through another pair of tunnels the first one named Calamity because of the number of people killed when building it and the second is called the Redgrave Tunnel named for a member of the 1862 Overlander Party. We crossed the Columbia River for the last time before passing through Donald and Moberly prior to stopping in Golden to drop off a dead heading freight train crew. We turned a corner and joined up with the Kicking Horse River. Moments later, there was the campground where my family used to stay. 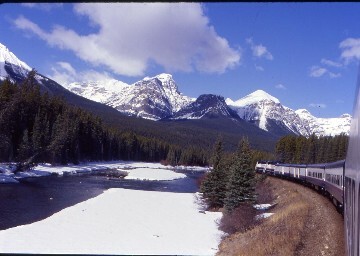 Well I may not be on the Canadian riding by this spot but I would take this train any day of the year. We entered Kicking Horse River Canyon crossing the river seven times in the narrow confines. There are also five tunnels and rock detector fences along its sheer cliffs. I was totally awesome as I clicked away with the camera. After passing through Ottertail we crossed Boulder Creek and in a few minutes later arrived in Fields for another crew change stop. Now for my Grand Finale a trip through the Spiral Tunnels another thing that I always wanted to do. We leave Fields and started to climb high above the Kicking Horse River. Once on a ledge we passed through tunnels and snowsheds before reaching Catherdal siding. From here we entered the Lower Spiral Tunnel inside of Mount Ogden turning to the left 226 degrees before exiting to a great view with the tracks that we had been on right below. We made a turn to the right to reach Yoho Siding before we reached the bottom portal of the Upper Spiral Tunnel turning to the right 288 degrees and exiting again to a great view and our former route below. All this to replace a grade of 4.5 percent when the CPR built through here in its beginnings. My one word after traveling through them is incredible for this engineering feat. We passed through Stephen next before reaching the Continental Divide at Kicking Horse Pass. 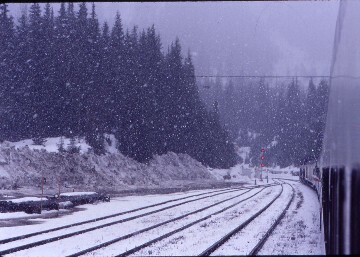 Here the CP has another westbound grade separation that runs down to Lake Louise with its log depot. 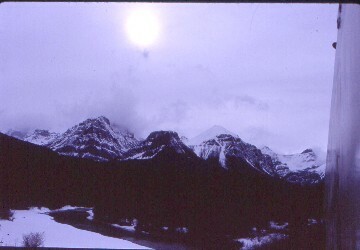 From here to Banff I photograph the peaks and a few herds of Elk. I love this train as I can ride in the vestibule and shoot all the pictures that I want. We arrived in Banff and detrain the majority of our passengers with only 40 passengers like myself going all the way to Calgary. The rest of the trip was peaceful with additional peak pictures taken along with train shots. I rode out in the vestibule until we were out of the mountains where I returned to my coach seat to enjoy the rest of my Rocky Mountaineer journey. We followed the Bow River all the way down to Calgary where we pulled into the old CP Station right next to the Calgary Tower. As I detrained, I said my goodbyes to all my new friends before heading next door to the Fairmount Palliser to spend the night in this ex Canadian Pacific Hotel. I watched the end of the first period of the Detroit-LA Kings playoff game with me learning the next morning that the Kings won 4-3 in overtime tying the series up at two games apiece. With all the excitement of the day, I had no problems falling asleep and slept the night away soundly. 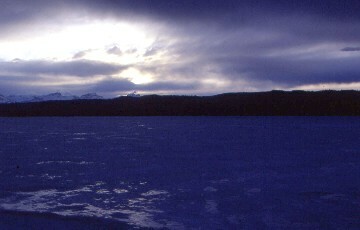 The day dawned clear as we departed Calgary along the Bow River and into the Canadian Rockies. This is the reason I made the round trip on the train. Cloudy going east, clear going west. Since I know where everything is now, I just sat back and only got up when I needed to. As I was out shooting one of the peaks a women says "I only get three or four good pictures with each roll of film that I shot. How many good pictures do you get per roll?" I showed her my camera and then said "Thirty three or thirty four excellent pictures with this camera." I think that she walked off thinking she needed to buy a new camera. I shot all the peaks, the Lake Louise Station, our journey up the westbound mainline which was my first new trackage of the day to Kicking Horse Pass and then our descent through the Spiral tunnels to Fields. I enjoyed my own Coca Cola since the train does not stock it which is the only negative thing that I could say about their service. The Rocky Mountaineer is a first class operation and I would recommend it to anyone who would like to see world class scenery. The Kicking Horse Canyon was even more enjoyable a second time around and with the clear skies the peaks west of Golden were photographed. I love an open top dutch door. We were moving along quite nicely until we had a yellow approach signal near Redgrave and a red over yellow at the switch to enter the siding. We pulled along side a westbound coal train which was stopped on the mainline. We pulled all the way down to the end of the siding then came to a halt. Our Crew then announced that there was a split rail ahead and that CP had a crew working on it. Our delay might be a hour or more. As with all delays I listened to music and did word fill in puzzles that always help to pass the time. This delay is a new one for me in my 609,000+ rail miles that had never happened to me before. During the delay our attendant Crystal served lunch. We got back moving after only an hour twenty minutes delay which is not all that bad. After all that sitting, I rode the vestibule all the way to the top of Rogers Pass and I put on music through the Connaught Tunnel. I was hoping that we would be run through the Mount Macdonald Tunnel but that just proves that you can not always get what you want. Upon exiting, I photographed most of the way down to Revelstroke. After a crew change and the crossing of the Columbia River, I got my second new piece of trackage of the day as we were routed on the westbound track. Now will I get the westbound line up Notch Hill later? I managed to get a picture of Kay Falls with a quick and lucky shot at MP 22. 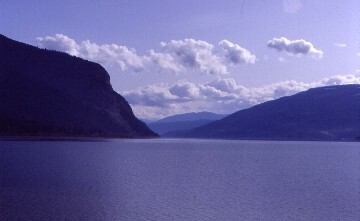 The sun shined brightly along the Salmon Arm of Shuswap Lake. A stop was made at Salmon Arm to bring on food though there was nothing that I could eat. While everyone else was eating, I enjoyed our run over Notch Hill on the westbound line of new trackage for me. The line's great looping horseshoe curve gave me prefect pictures of our train as well as being less calories than what the other passengers ate. Our car attendant Crystal tells us that tomorrow we will be having a contest for the best poem about a salmon after she told us about the life span of a salmon hatched in the Adams River. I think that I can come up with something. I am one happy and tired train rider as we arrived in Kamloops in the twilight of the night a little late but what a trip. There was no Two Rivers Junction Dinner Theater tonight due to our lateness of the train so I was glad that I went two night ago. This night's stay was at the Thompson Hotel right downtown. I went to Dairy Queen for dinner and then the Casino where I played five dollars of quarters in the slot machine and walked out with eleven. I returned to my room for a good night of sleep. At least that is what I thought I was going to get. Click here for the Day Three picture page. I twisted and turned most of the night as I had come down with the flu. Luckily I always carry some over the counter relief so I took some and managed a couple good hours. I woke up and took the bus back to the train where all these early mornings of this trip caught up with me and once on board I laid across the two seats and fell asleep until we departed. Once on the move the fresh cold air of the vestibule was all I needed to wake up. We slowly moved back up the branch line to the CN mainline as today is an all CN trackage day where we turned west. 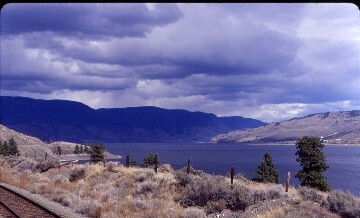 I enjoyed Kamloops Lake and took a few more pictures along it. Today is select a picture day until the Fraser River Canyon so I sat in my seat for the most time in all four days. My memory tells me when I should get up like in Black Canyon, Basque, Skoonka Tunnels and the Thompson River Canyon. It is totally awesome. Words can not describe the beauty of it. You must ride this train to experience it! While all of this great scenery was taking place we had our salmon poem contest. Here is mine for your enjoyment. that is my only chance I have to survive. and if I am lucky I just might win. at least I am not in your store. for what I do may seem strange. I spawn and die for new life to bring! I took a third place which was ok for something I wrote in less than five minutes. 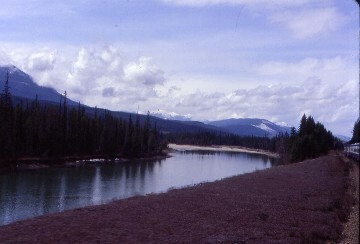 The word striking describes the difference in water coloring where the blues of the Thompson River and the muddy brown of the Fraser River meet. It is a lesson in density. The bridges at Cisco were the next highlight followed by Hell's Gate. I thought that the CP line was rugged when I was on it but you can appreciate it more fully from the CN line. Weather wise it is a perfectly clear day and enjoying the Fraser River Canyon in an open vestibule is the perfect way to be enjoying it. After an hour of outstanding scenery all good things must come to an end and the valley opens up. The good news is that every mountain peak is visible so I am in my prime element of picture taking. Running wise we did so well running over the CN mainline and being the first trip of the year that CN was not expecting us so early at Thronton Yard so we were routed right down the middle of the yard. We crossed the Fraser River for the last time on the Rocky Mountaineer before we arrived in Vancouver where the train was wyed and then split into two sections to fit in the station since Via's Canadian was preparing to leave for Toronto. Click here for the Day Four picture page. As I detrained I headed straight to a phone to see about getting a room down in Seattle which I did then I changed my thruway bus ticket for early tomorrow morning to a Talgo Business Class Ticket for this evening so I could get a full night sleep and maybe shake this bug. I called the Day's Inn and canceled my room in Vancouver for the night. I exchanged my money, collected my bag thus ending my Rocky Mountaineer Experience. What an experience. Four days of the most beautiful scenery, vestibule riding, picture taking and meeting people from all over the world. 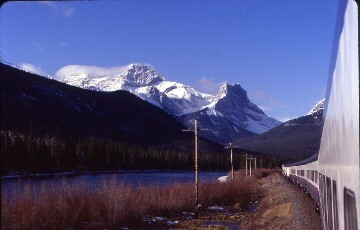 They truly live up to their motto of "The Most Spectacular Train Trip in North America!" That says it all. What a trip!